Because any educated imagination is willingly engaged with the (cough) “real world” — which is really only the awful place where awful things happen to people on the nausea-inducing assumption that it is necessary — it will also bear witness to a truly depraved mind. 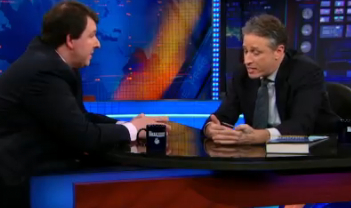 Marc Thiessen was on Jon Stewart’s show last night. Thiessen is a former Bush speech writer, a tireless apologist for torture, and now a “columnist” for the Washington Post, a once great newspaper being run into the fevered swamps of neoconservative paranoia by editor Fred Hiatt. It is a stomach churning experience to listen to someone like Thiessen and to know he wields power and influence. But it serves as a reminder of just how wretched a place such a world is — and why. For the rest of us, it’s got to be about vigilance. We can start by making a point of knowing what the rogues, the frauds, and the closet sadists are actually up to. In Canada, the entire unedited interview can be seen here. In the rest of the world, it can be seen here. The American fascist would prefer not to use violence. His method is to poison the channels of public information. With a fascist the problem is never how best to present the truth to the public but how best to use the news to deceive the public into giving the fascist and his group more money or more power. This entry was posted in Politics on March 10, 2010 by Michael Happy.